The Vernier Optical DO Probe is a luminescence-based optical dissolved oxygen sensor. It can be used to measure the concentration of dissolved oxygen in water samples tested in the field or in the laboratory. Select units of mg/L or % using the switch on the cable box. Start the appropriate data-collection software (Logger Pro, Logger Lite, LabQuest App) if not already running, and choose New from File menu. The software will identify the sensor and load a default data-collection setup. You are now ready to continue your experiment. Remove the storage bottle and place the tip of the probe into the sample water. It should be deep enough so that the metal dot on the side, which measures the temperature of the water, is submerged. 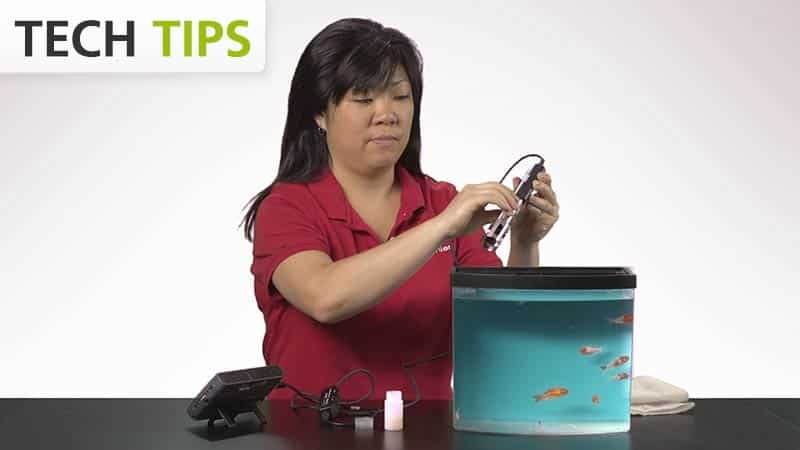 The Vernier Optical DO Probe is designed so that the tip of the probe can be submerged in an aquatic environment for extended periods of time. The entire probe can only be submerged up to 1 meter in an aquatic environment and for a maximum of 30 minutes. The body of the probe and cable are waterproof, but the box containing the microSD card is not. If the seal on the probe is damaged, liquid may get into the probe and cause damage. This probe is not designed for long-term immersion applications. This probe compensates for temperature automatically. Make sure the metal dot near the tip is immersed for the temperature compensation to work. If you are taking readings at temperatures below 15°C or above 30°C, allow more time for the temperature compensation to adjust and to provide a stable reading. This probe is automatically pressure compensated using a barometer built into the cable box. The pressure reading is used to automatically compensate for the change in diffusion rate of oxygen through the cap and oxygen solubility in water eliminating the need to recalibrate at different pressures or elevations. Artificial light sources, such as those used for investigating photosynthesis of aquatic plants, can interfere with the Optical DO Probe as it uses fluorescent technology to measure dissolved oxygen. The light shield (included) is designed to block this light from interfering with the sensor cap. This probe should be used in aqueous solutions only. Do not place the probe in viscous, organic liquids, such as heavy oils, glycerin (glycerol), ethylene glycol, or alcohols. Do not place the probe in acetone or non-polar solvents, such as pentane or hexane. The Vernier Optical DO Probe allows the user to choose between units of mg/L or percent saturation (%) using a switch on the cable box. The unit mg/L is an absolute measurement of dissolved concentration, expressed as milligrams of oxygen gas dissolved per liter of water. Percent saturation (%) is a relative measurement in which the dissolved oxygen concentration is expressed as a percentage of the maximum amount of oxygen that water can hold at a given temperature and pressure. Percent saturation is described by the following equation. Set the switch to % (both % and mg/L settings will be reset simultaneously while on the % setting). Add distilled water to the storage bottle to the top of the sponge. Insert the probe into the bottle. The tip of the probe should not be touching the water or the sponge. Keep the probe in this position for a minimum of 60 seconds. Use a small paper clip to press down the reset button for three seconds. The reset button is located on the bottom of the cable box. Release the button. The reading will drop to near 0%. Wait for the reading to change to near 100%. This can take anywhere from 30 seconds to several minutes. Once the reading is near 100%, wait an additional 30 seconds for the reset process to complete. Note: This waiting time is important for the probe to internally save the reset information. The storage bottle can now be removed and the probe is now ready to use. When you have finished using the Optical DO Probe, rinse it off with distilled water and blot it dry using a paper towel or lab wipe. Insert the probe back into the storage bottle containing the sponge, dampened with distilled water. The tip of the probe is a replaceable screw-on cap called the Optical DO Probe Cap. This cap is warranted to be free from defects for a period of two years from the date of purchase; it is possible that you may get somewhat longer use than the warranty period. If you start to notice a reduced response, it is probably time to replace the cap (order code ODO-CAP). To extend the lifetime of the cap, do not expose to direct sunlight for an extended period of time. The Optical DO Probe operates on the principle of reversible luminescence quenching of a luminophore by oxygen as it passes through the cap. The cap is coated with a luminescent compound encased in a matrix for protection. Blue light from an LED is transmitted to the cap and excites the luminophore. A collision of an oxygen molecule with the luminophore in its electronic excited state results in energy transfer from the luminophore to oxygen. As the luminophore relaxes it emits red light. The time from when the blue light is transmitted and the red light is emitted is measured by a photodiode. The more oxygen that is present, the shorter the time it takes for the red light to be emitted. where τ0 and τ are the luminescence lifetimes in the absence and presence of oxygen, respectively, [DO] is the dissolved oxygen concentration, and Ksv is the Stern-Volmer quenching constant. The Stern-Volmer constant (Ksv) depends directly upon the rate constant for the diffusion of oxygen, the solubility of oxygen, and the natural lifetime of the electronic excited state of the luminophore. Lifetime measurements have an advantage over intensity measurements since they are not usually affected by processes which result in loss of the complex, such as bleaching or photodegradation. Give the probe a few minutes to equilibrate in the sample, especially if the water is not at room temperature. Reset the calibration using the instructions above. If you have watched the related product video(s), followed the troubleshooting steps, and are still having trouble with your Optical DO Probe, contact Vernier Technical Support at support@vernier.com or call 888-837-6437. Support specialists will work with you to determine if the unit needs to be sent in for repair. At that time, a Return Merchandise Authorization (RMA) number will be issued and instructions will be communicated on how to return the unit for repair. Vernier warrants this product to be free from defects in materials and workmanship for a period of five years from the date of shipment to the customer. The cap, SD card, Light Shield, and Storage Bottle are all exempt from the warranty as consumables. This warranty does not cover damage to the product caused by abuse or improper use. This warranty covers educational institutions only.